Were Bloggers Wrong to Block Brennan for CIA? When President-elect Obama rolled out his national security team at a press conference in Chicago Monday, there was no CIA director on stage. Until November 24, Barack Obama had John Brennan on a short list to become the next director of the Central Intelligence Agency. Brennan is co-chair of the Obama review team on Intelligence matters. But after intensive criticism from progressive bloggers, and a negative letter from a group of 200 psychologists, Brennan wrote to Obama and took himself out of consideration for any appointment in the intelligence sector.
. . . Brennan wrote in a Nov. 25 letter to Obama that he did not want to be a distraction. His potential appointment as CIA director has raised a firestorm in liberal blogs that associate him with the Bush administration’s interrogation, detention and rendition policies. 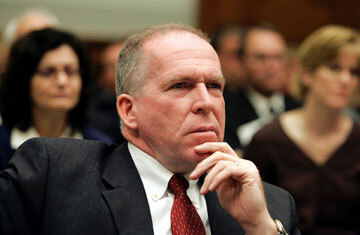 Brennan, a 25-year CIA veteran, helped establish the National Counterterrorism Center and was its first director in 2004. He has privately and publicly said that he opposed water boarding and questioned other interrogation methods that many in the CIA feared could be later deemed illegal. . . .
I’ve interviewed Brennan on a number of occasions, and he impressed me as an intelligent and thoughtful critic of President Bush’s entire so-called War on Terrorism. Brennan was one of the first top officials to ridicule the idea of calling it a “war,” and he is a supporter of a far more nuanced, supply-side approach to dealing with terrorism. He is a proponent of dealing with the root causes of terrorism, not just fighting its manifestation. Obama’s national security team “are drawn exclusively from conservative, centrist and pro-military circles without even a single — yes, not one! — chosen to represent the antiwar wing of the Democratic party.” In his plaintive post this week on the Nation magazine’s Web site, Robert Dreyfuss indulges in the political left’s wonderful talent for overstatement. But who are we to interfere with his despair? Given their right-wing proclivities, the Journal’s editorial writers then offer the equivalent of high praise for Obama’s choices: “So far,” they conclude, “on security, not bad.” That should make just about anyone who voted for Obama to change American global policy in significant ways pause a moment for reflection. If the Dark Prince is relieved, does this mean Obama’s team is prepared to fulfill the dream of the neo cons and drag the US into yet another war in order to remove Iran as a threat to Israel’s security? Senator Clinton’s support for Israeli war policies should also “relieve” Perle’s worries over a new administration. She bring a less than stellar record on human rights to her new position. Stephen Zunes writes for Alternet.com that as a senator, Clinton was among. . .
. . . . a minority of Democratic Senators to side with the Republican majority in voting down a Democratic-sponsored resolution in 2007 restricting U.S. exports of cluster bombs to countries that use them against civilian-populated areas. Each of these cluster bomb contains hundreds of bomblets that are scattered over an area the size of up to four football fields and, with a failure rate of up to 30 percent, become de facto land mines. Civilians account for as much as 98 percent of the casualties caused by these weapons. She opposed UN efforts to investigate alleged war crimes by Israeli occupation forces and criticized President Bush for calling on Israel to pull back from its violent re-conquest of Palestinian cities in violation of UN Security Council resolutions. I agree. If Obama’s choice for CIA director also comes from what the WSJ describes as the same “conservative, centrist and pro-military circles” that gave Obama his national security team, doesn’t that leave the pro-war Israel Lobby-neocon crowd firmly in charge of our Middle East policy? It does, unless Barack Obama really means it when he says that it is his vision that will prevail. But what is that vision, exactly, if he feels comfortable with a national security team that thus far, has not a single anti-war member that plays either point guard or at the very least, a sixth man role on his team? 1 Response to Were Bloggers Wrong to Block Brennan for CIA? Also, I think they’ve had 4 or 5 stories on Brennan.